Think of a camera and most of the time the image of a digital SLR comes to mind. But how about a mini camera the size of a USB flash drive? Is that even possible? Ankaka’s new release confirms that it is. 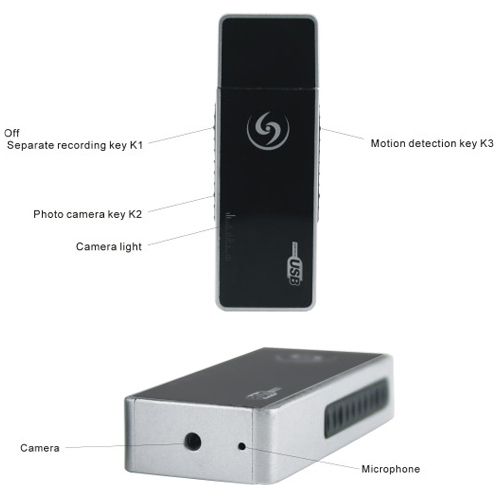 The company has come out with its Mini DVR USB Disk HD Camcorder Camera, proving the possibility of a mini USB camera. One of the smallest cameras in today’s tech market, the Chinese-manufactured device is capable of more than its size lets on. Possessing the ability to store up to as much as 32 GB of memory, the Mini DVR USB camera can take its fair share of pictures and videos. As previously mentioned, it’s about the size of a standard flash drive and weighs just about as much. Embedded into its inconspicuous casing is a 5.0 pixel high definition camera that can capture photos with a resolution as high as 1600 x 1200 pixels. Some other features packed into Ankaka’s tiny USB camera are motion detection and an automatically cycling recording. These features make it easy for users to capture and record videos, especially when cycling between pictures and videos. The camera records into videos into AVI files and encodes them as M-JPEG. Being a high definition camera, the Mini DVR USB Disk HD Cam can capture videos with a resolution of 1280 x 960 pixels. Not bad for something so tiny, though its size may be a factor in as to why it can only record videos with a 4:3 aspect ratio. Though not a perfect device, the Ankaka Mini DVR USB HD Cam has more highlights to offer. One other highlight is that its lithium polymer batteries are high capacity. The batteries are capable of lasting through 120 minutes of non-stop video recording, more than enough operating time to get in a couple of long takes. Captured pictures and videos can be stored on a micro TF card, the memory card compatible with the device. The mini USB camera is primarily a Windows device, offering support for Windows Me/2000 and later versions. The Ankaka Mini DVR USB HD Camcorder retails for $22. Ankaka also offers wholesale pricing for interested businesses. This entry was posted in USB Gadgets and tagged Ankaka, Digital Video Recorder, Spy Camera, USB camera. Bookmark the permalink.